Seventy-two million consumers are speaking with their wallets about the value of email, according to a 2013 survey that tracked customer acquisition across 86 retail sites. The survey found that email is now the number three source of customer acquisition,surpassed only by organic search and CPC. Meanwhile, affiliate channels (including affiliate email) have been steadily gaining momentum over the past five years, as social media channels have remained relatively flat. 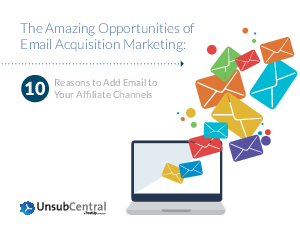 Need more reasons to put affiliate email in your acquisition game plan? Here are ten, broken down into four core categories.